Kristi Krafft-Bellsky has been promoted to director of quality control for Yeo & Yeo CPAs & Business Consultants, a Saginaw-based accounting firm with offices across the state. Krafft-Bellsky, based in the firm’s Saginaw office, will be responsible for internal quality control throughout Yeo & Yeo’s nine offices. She oversees the development and implementation of policies and processes to comply with professional standards and regulatory requirements. She will also assists in the standardization of work papers and financial statements across the firm to ensure technical compliance and efficient processes. Krafft-Bellsky, with the assistance of the Yeo & Yeo Quality assurance committee, will oversee the peer review process and conduct the internal inspections of files to guarantee that Yeo & Yeo continues to provide quality services for clients. 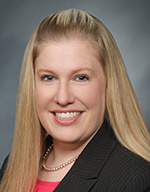 Krafft-Bellsky joined Yeo & Yeo in 2003, most recently holding the position of senior manager in the firm’s audit group. She is a member of the firm’s audit services group and education services group. In our community, Krafft-Bellsky is a member of the Frankenmuth Jaycees and treasurer of the Frankenmuth Community Foundation’s Legacy Ball Committee. She is a graduate of the 1000 Leaders and Leadership Saginaw programs. Krafft-Bellsky, of Frankenmuth, holds a bachelor of professional accountancy and a Master of Science in accountancy from Western Michigan University.